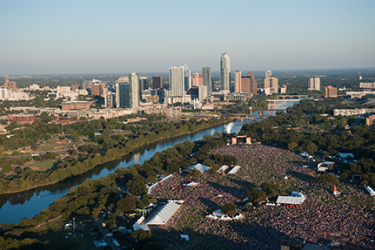 The ACL Music Festival brings together more than 130 acts from all over the world to play rock, indie, country, folk, electronic and more on eight stages. Join music fans from across the country for the annual migration to Zilker Park. For the third consecutive time the festival spans two weekends, Oct. 2-4 and 9-11, 2015. A sold-out event since 2004, an estimated crowd of 70,000 flocks to the festival&apos;s stages, while filling up on dishes and drinks from a bevy of local vendors. Some of this year&apos;s line-up includes the Foo Fighters, Florence + the Machine, The Strokes and Drake, plus local acts with ever-growing followings like Koa, Bee Caves and The Nightowls. You&apos;ll more than likely discover your new favorite band and vow never to miss an ACL weekend. Break out the lederhosen for Austin&apos;s answer to a typical Bavarian Oktoberfest. The Austin Saengerrunde event hall opens its doors on Oct. 17, 2015, for AustOberfest. Celebrate the German heritage of central Texas with all-you-can eat sausage from local purveyors and plenty of beer to wash it down, a contest stage, bowling and live music. Acts like the Minor Mishap Marching Band, Brave Combo and Czech Melody Masters will set the mood with polka and waltz tunes, so grab a dance partner. The Texas Book Festival brings together word nerds, bookworms, aspiring librarians, kids, adults...pretty much anyone who appreciates the profound passion behind the written word. The free annual literary event, in its 20th year, will be held Oct. 17-18, 2015 at the Texas State Capitol Building and various venues around Austin. The fest is free and open to the public and features more than 250 authors, live music, cooking demonstrations, children&apos;s activities, the popular Lit Crawl event and more. Past festival authors have included Junot Díaz, Robert Caro, Naomi Woolf, Cheryl Strayed, Tony Danza, Dan Rather, Emma Straub, Tim O&apos;Brien, Austin Kleon and Jewel. Recognized as one of the top film festivals in the country, this eight-day cinematic event shines the spotlight on top-billed films and Indies. The festival and conference takes place Oct. 29-Nov. 5, 2015 at the Paramount Theater and various downtown venues. Celebrating more than 20 years, the film fest includes premieres, advanced screenings, independent films and Q&A sessions with cast members and filmmakers, followed by parties at bars and restaurants throughout Austin. This eclectic Auditorium Shores event takes place Nov. 6-8, 2015, and is beloved for its spotlight on underground and progressive musicians, along with comedy acts, action sports, local fare and poster art. Now in its 10th year, Fun Fun Fun Fest has quickly gained ground as the nation&apos;s best underground punk and alternative music festival. Multiple stages dedicated to different genres of music, comedy and other antics host entertaining shenanigans like wrestling, a veggie-hot-dog-eating contest and punk rock comedy hour. Performers run the gamut from Jane&apos;s Addiction and Venom to Wu-Tang Clan and D&apos;Angelo. For a taste of Irish, Scottish and Breton culture, the Austin Celtic Festival delivers music, dance, sports, food and more. From the folk melodies of The Alt to the lively rhythms of Ten Strings and a Goat Skin or Silver Thistle Pipes and Drums&apos; traditional Scottish tunes, a full schedule of Celtic music performers is set for Nov. 7-8, 2015, at Fiesta Gardens. When you&apos;re not participating in a dance workshop or watching an Irish dance team take the stage, check out the Celtic dog parade, Highland Games for adults and kids or a battle demonstration.